An East Bay community is rallying behind a longtime business owner and family man after the father of three was detained by ICE agents. Brentwood resident Ramzan Chaudhry entered the United States illegally from Pakistan when he was just 15. Now, his final deportation order is up, and his wife and children fear the worst as they plead for his release. "I have all A’s, and I can’t focus, and I don’t want my grades to go down," daughter Kinza Chaudhry said. "All I do is think about my dad. I just want him back now right now." Kinza, 14, and her siblings say they’re lost without their father. Ramzan Chaudhry, who immigrated to the U.S. illegally, was called in for an interview by Immigration and Customs Enforcement seven weeks ago. He’s been detained ever since and faces deportation back to Pakistan. "It was the day before my birthday he got to the detention center," son Majid Chaudhry, said. "I didn’t see him on my 13th birthday." 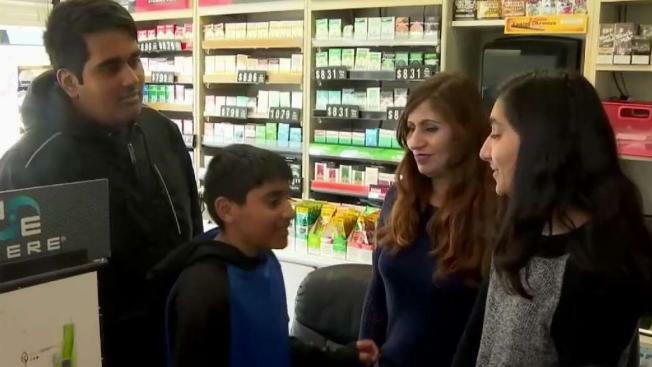 Ramzan Chaudhry and his wife own a gas station in Brentwood. Asia Chaudhry is doing her best to run the business on her own, but she’s barely hanging on. She says her husband is a hard-working man who has never even had a parking ticket. "We’ve never broken any laws, never done anything wrong," she said. "This is so unfair." The community is rallying behind the Chaudhrys, hundreds of signing a petition pleading for his release. "There’s no reason for him to go through this," customer Shaudra Rodriguez said. "She’s a citizen, the kids are citizens." Chaudhry’s wife and three children say they fear for his safety if he’s deported to Pakistan. They can’t imagine life here without him. "I miss him so much," Majid said. "Every time I see him at the detention center, every Sunday, I try to stay strong for him, but it’s hard. I just wish he was back." Kinza added: "He’s always been so supportive, and I love him so much."